The things we carry, part 2. What's in the pack? 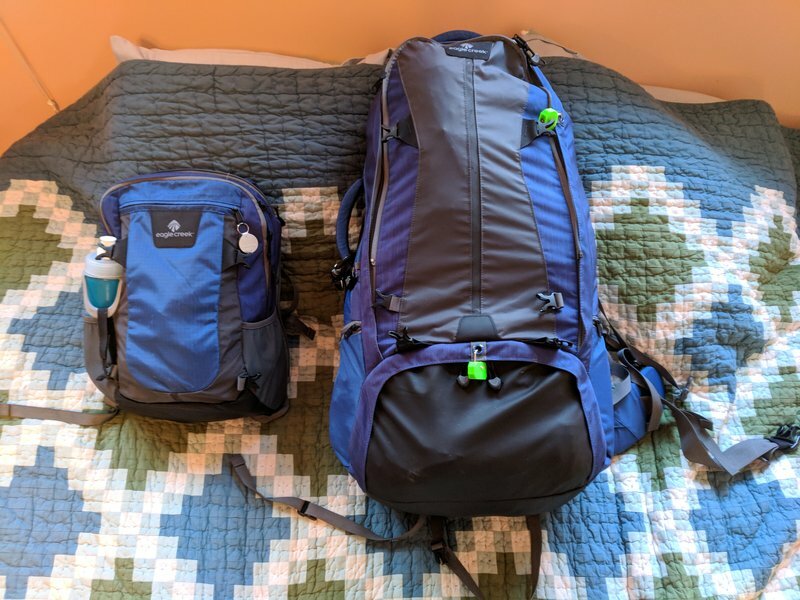 Daypack/carry on and main pack. These packs are making their 5th trip to Europe. They are made by a company called Eagle Creek and have served us well. 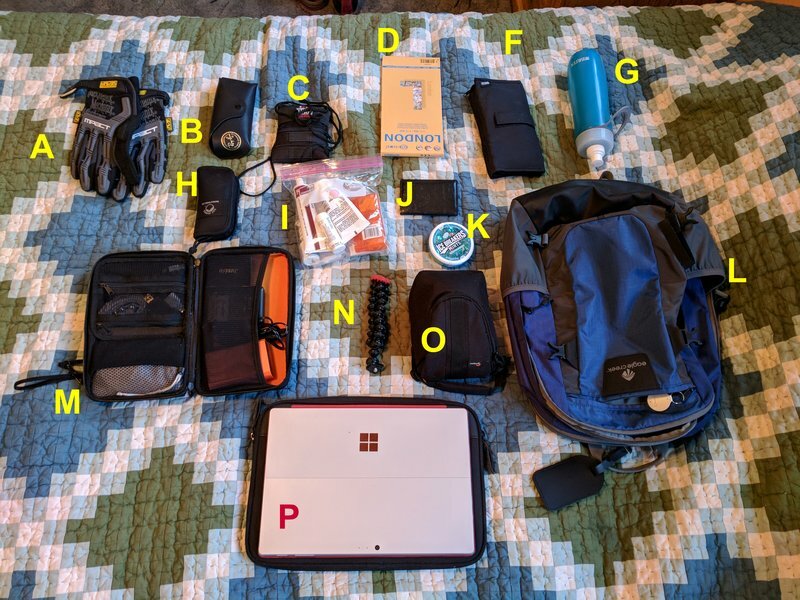 I see many posts on "what's in the backpack". This is a personal question and an accurate answer is based on many factors. These factors include destinations, personal taste, personal needs, situations to be encountered, the reasons go on and on. In reality, there are no hard and fast answers for this question.......the answer will be different AND accurate for each person on each particular trip. This is what works for me, on this particular trip. Your results, along with your choices, may vary. 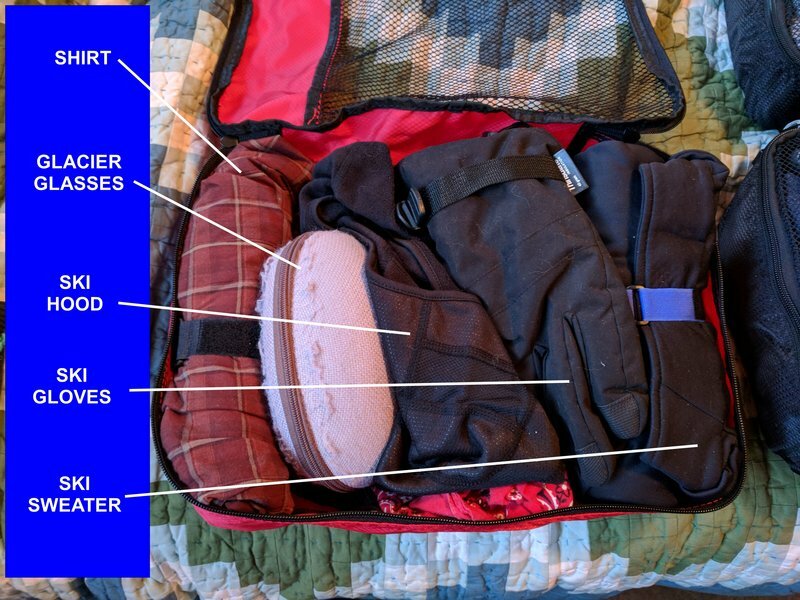 I have preached "travel light" for a long time, and for general travel, this is a great plan. On our upcoming trip, however, I have a special situation. We will be visiting two different climates and I will have to be prepared for both. This difference will add around five pounds (two kilos) to my pack, bringing it to 35 pounds (16 kilos). While more than I carried last year, it is still much lighter than many people travel with. We still have all of our stuff in a backpack and a daypack. Considering what we are carrying, this isn't bad at all. We will be dealing with with winter cold in the mountains, and relative warmth by the sea. We need heavy and we need light, and in this pack we have both. 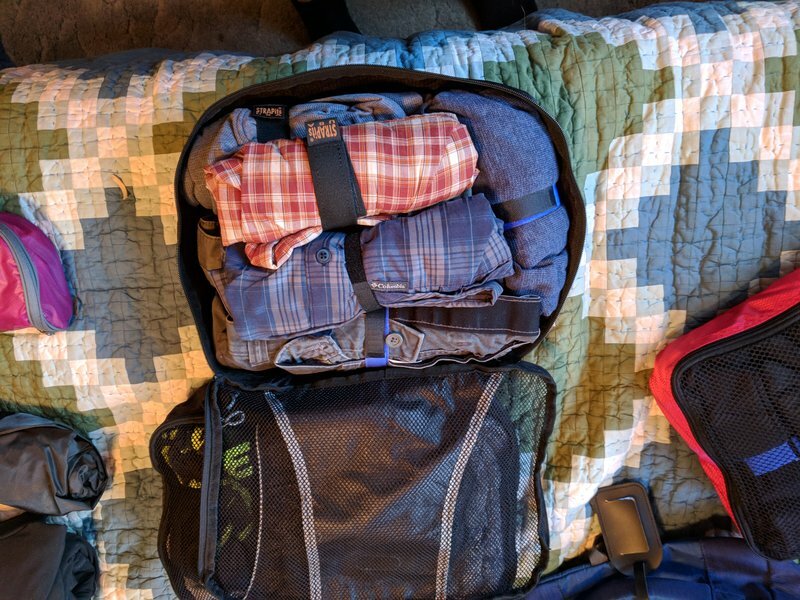 As always, I use packing cubes. These make finding things MUCH easier and loading and unloading much quicker. Let's dig in and take a look. A-Toiletries: This is self explanatory. Toothbrush, deodorant, floss, etc. B- Pack Duffel: When flying, we place our main pack in this duffel. It protects the pack from damage, keeps the straps from getting hung up in baggage equipment, and protects it from spills and weather. C- Light jacket: I'm wearing a heavy coat on the plane as our first destination is quite cold. Our second is much warmer. I've anticipated a need for a much lighter jacket. Time will tell if this is needed or I over packed. D- Canvas shoulder bag: I've carried this bag all over Europe, on every trip we've taken. It is a Czech gas mask bag that I purchased years ago from an army surplus store. Perhaps it is sentiment, but in reality it is a perfect size for a raincoat, camera, maps, and the small items I need while wandering around. While I have a day pack, this sits better and is smaller. Maybe at some point I'll move on, but this trip is not it. E- Ski pants: This one is pretty obvious. We're headed for cold and I'll need these. F- Pants and shirts: Once again, obvious. 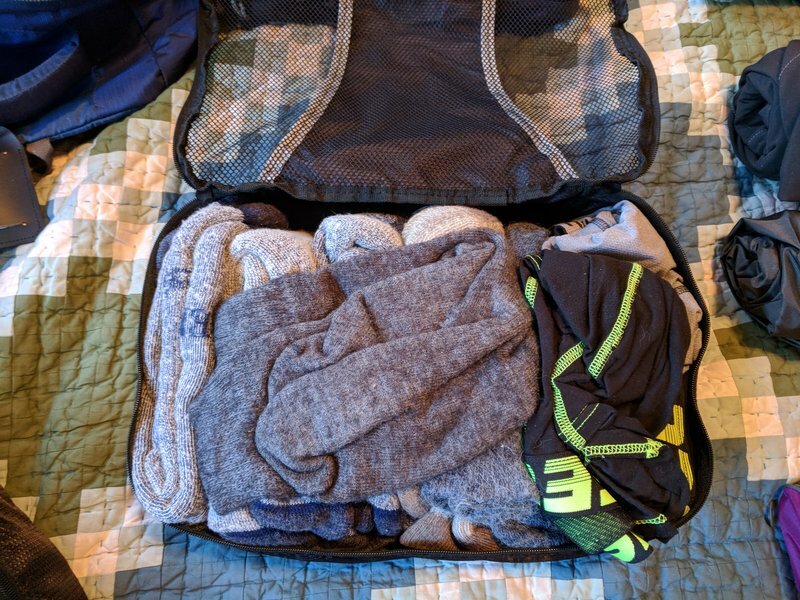 I bring 5 shirts, and two pair of pants in this cube. G- Socks and underwear: 5 pairs of socks (I threw in an extra as I expect wet socks on this trip), and 5 pairs of underwear. H- Junk Drawer: A junk drawer in the kitchen holds a multitude of different items. This is my junk drawer. We'll take a look at what's in it later in this post. I- Misc. Item cube: Kinda like the junk drawer, but less junky. J- Ski stuff: Ski items. K- Main pack: This is where all the cubes go. I've found that rolling items is a fantastic way to save space. I have straps that I use on each item to keep them rolled up. They're inexpensive and easy to find on Amazon. Let's look in the cubes and see how it works out. ​Four shirts and two pairs of pants were all that would fit. I'll have to put my fifth shirt in another place. ​Socks and underwear. I prefer merino wool hiking socks. Underwear is up to the wearer.....far be it for me to give you pointers on that. This bag contains items I'll need for our stop in the mountains. It also includes that extra shirt as there was a bit of space in this cube. It is not visible or labeled, but my knee brace is in the bottom of this cube. These are my ski items, and if you haven't guessed.....skiing will be involved. 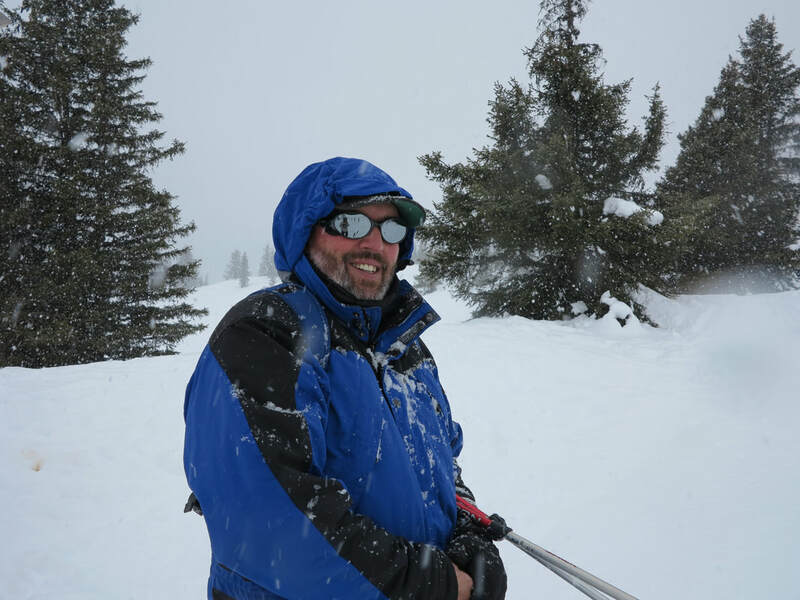 The ski items are responsible for the extra weight on this trip and if we're going skiing, we need to dress properly. Hypothermia and frostbite are experiences I would prefer to avoid, this trip as well as any other. We have to remember that if we have a goal of "going light" but it does not meet our needs, we fail. Everything is a trade off, and if we want to do this particular activity we will have to carry extra weight. This is a sacrifice that I not only must make, I WANT to make. I'll tote the weight and I'll be happy about it. These miscellaneous items are important. I often put scattered items in multiple cubes, but had no extra cube room this time. They live in a cube of their own this trip. We have our laundry bag, my rain coat, our first aid kit, maps, and skin care stuff in this cube. With the exception of the raincoat and skin care stuff, these items are "shared" items. 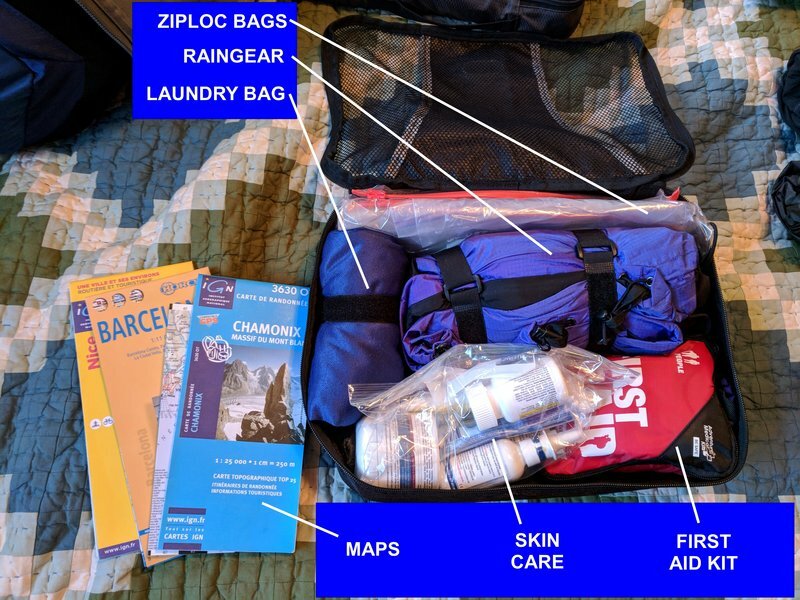 The maps, laundry bag, and first aid kit are in my bag and my wife Laurie does not carry similar items. We share the laundry bag, roll it and put compression straps on it, and strap it to the outside of my pack when we change locations. ​We take the proper map out of this cube and put it in the shoulder bag for daily sight seeing. I hope we don't have need for the first aid kit, but it's like a seat belt. You don't carry it because you expect to use it, but in case you need it. Ziploc bags are tough to find in Europe so we always keep a few for storage of snacks, bread, wet laundry, etc. Our "junk drawer" cube. This has a huge number of random items in it. While the "junk drawer" cube looks like a large collection of unnecessary items, there isn't a single item in this cube that I have not used multiple times on our trips. I didn't label all the items, just the ones that jumped out at me. 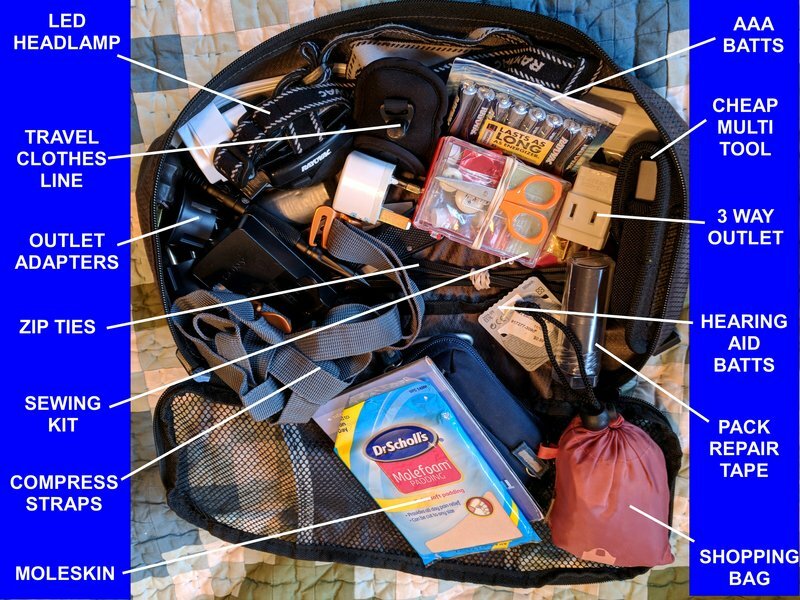 These are "my" items and things I deem important and worth the weight to carry. And as I said, there isn't a single item in this cube that I have not needed or used. The labels are self explanatory. The LED headlamp was used after my wife went to bed to read by, to explore a castle in Germany, a lots of uses. Moleskin was used to cushion a blister Laurie had in France. Hearing aid batteries are of course for my hearing aids (I ain't getting any younger). Cheap multi tool has been used for so many things I can't remember them all. The reusable shopping bag has been used to carry groceries, laundry, souvenirs, and a multitude of other items. A- Gloves: I carry a pair of Mechanix gloves in my pack. They aren't heavy and I wear them quite a bit. It makes handling bags and such much easier on my hands. They keep my hands warm in "marginal" weather and keep them from drying and cracking. B- Sun glasses: These MIGHT be used for bright days and such. Or used in a feeble attempt to look cool. C- Small pouch: This contains earbuds and a charging cable for my phone. This keeps the cables in one place and makes them easy to find while on a plane. D- Map: Map for the first destination, easily available. E- Note that I did not use the letter "E" in a clever ploy to see if you're playing attention. Or maybe I screwed up and went straight to F. Either way, I ain't telling. F- Prescription meds: This is a folio where I can put each day's meds in a small pouch. It is much smaller than pill trays or bottles, and is a good way to organize. G- Water bottle: This is a refillable, filtered water bottle. We both have one, and bring it empty though security. We then fill it after clearing security. It's easy to get dehydrated on long flights. Fill this bottle, drink it during the flight, and drink other stuff they offer you. If not, you won't feel as well when you reach your destination. Hydrate. H- Memory wallet: This is a new addition. I will admit it is very light and small and doesn't take up much space. With the blog, camera, and other items, I find myself carrying flash drives and memory cards. This is a small and simple way to keep them all organized and to keep from losing any of them. I- Misc skincare stuff: I use prescription skin care items as well as non prescription moisturizers. I put them in the TSA required quart bag so I'm ready to go through security. J- Business card wallet: I have business cards with our email address, a small pic of us, and the blog URL on them. We give them to people we meet who are interested or we wish to stay in contact with. K- Mints: Fresh breath is always appreciated. L- Day pack: The actual day pack itself. All this stuff fits in this pack and we carry it on the plane. M- Electronics folio: This contains a multi-port USB charger that we will share, battery charger for my camera, a power bank battery, and any cables I need to charge things or transfer files. N- Mini gorillapod: This is a small mini camera tripod that I've found quite handy. O- Camera case: This has my camera and extra batteries. The case protects it while being toted around. ​P- Microsoft Surface: My new blogging platform. I had planned on bringing a bluetooth keyboard and android tablet, but blogging has proved a bit cumbersome with this equipment. The Surface is much better suited for blogging and sharing photos. 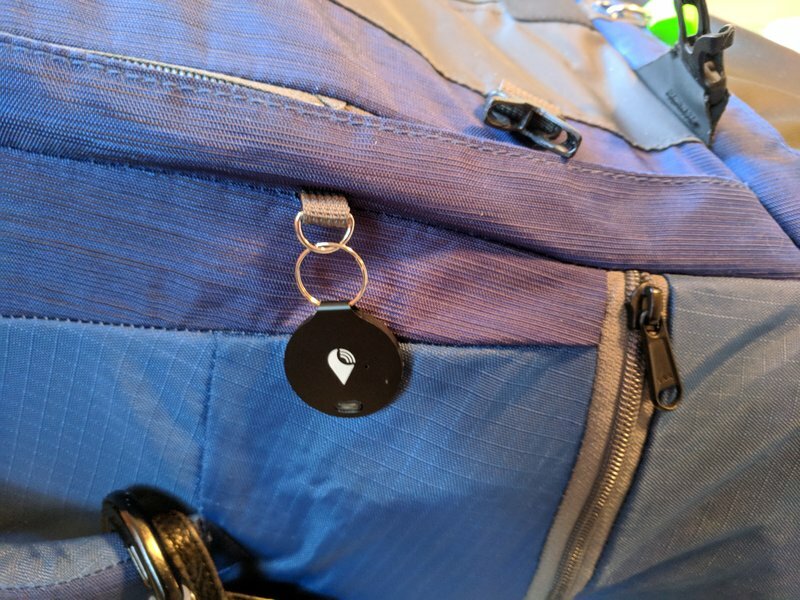 This is a bluetooth tag that we have on each of our bags. We theoretically will be able to locate our bags with our phones. This is a new items we're using.......I'll report on how well it works. 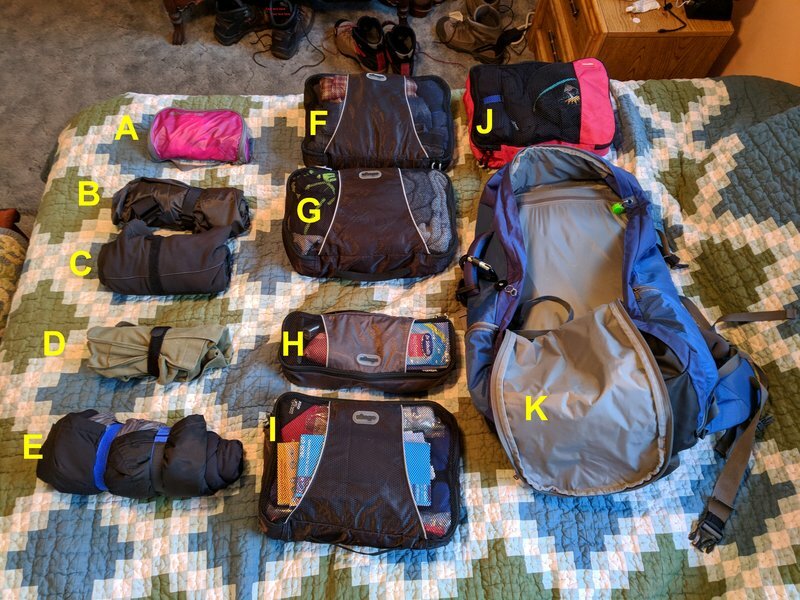 These are our things, packed and ready for our upcoming trip. Yes, it's a little heavier than I like, but I need the things I'm taking. I'm also traveling much lighter than most folks, even with the extra load. Keep an eye out for our next trip and if you want to get a notification and a link when I post during our travels, shoot me an email.